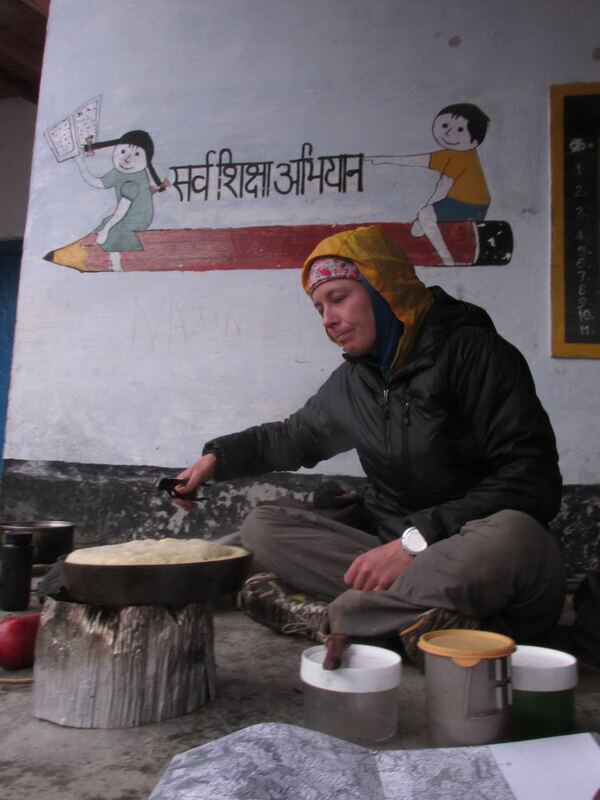 The day started much like the previous ones in India, with us cooking on a porch and rain falling from the sky. This morning we were in Khati, a small village along the Pindari River home to some 200 inhabitants. When we woke the lack of a precipitating rhythm on the fly along with the blue sky above gave us hope for a drier day. We are camped in a school yard, the four tents pitched on small grass and dirt patches amid cobblestone paths and concrete structures. The brightly painted schoolhouse is locked up tight despite it being a “school day” and a number of school aged children running around the premise. School teachers are hard to come by in this village, and many others, due to the challenging nature of the commute: walking to and from the community for several hours in each direction. On the porch beneath a painting of two children riding a giant pencil, Jesse bakes a breakfast cake. Our goal for the day is Dwali, a small cluster of tourism inspired buildings and businesses a paltry nine kilometers up the Pindari River at it’s confluence with the Kafni River. Madhu, Bharat and I quickly take the tent down as an imposing grey cloud pokes its nasty head over the steep, oak covered ridge to the west. It does not disappoint and quickly begins releasing its heavy droplets. Later, we take advantage of our covered location for a quick class and then begin our damp migration eastward. Cobblestone paths lead up and around landslides and steeply eroded creeks. Lush greenness, pink and red rhododendrons and cannabis plants all line the path. Hiking with Bharat, our group has the recent, local knowledge and we we make decent time up the quickly deteriorating trail. 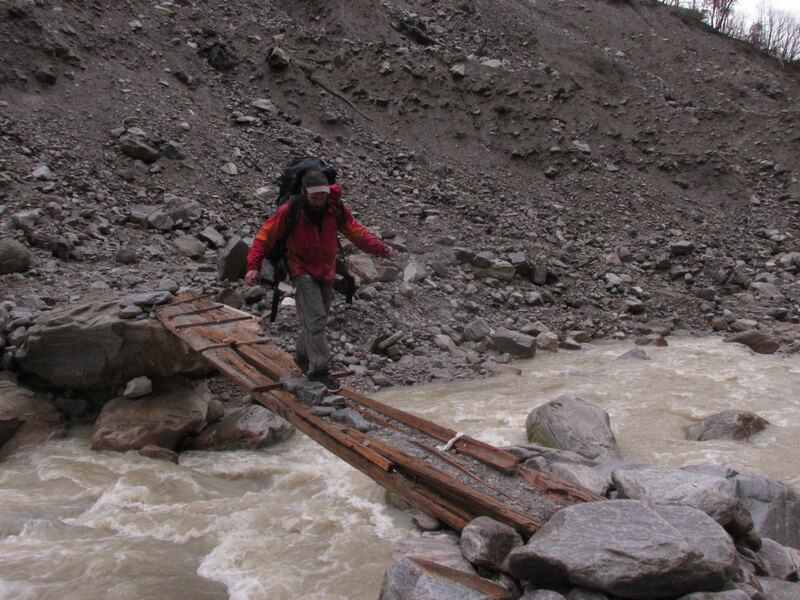 During the 2013 monsoon season (June-August) major flooding wreaked havoc on this once popular trekking route. The major flooding and subsequent landslides took out large bridges and destroyed large sections of the well built, and improbably constructed, stone paths. The route, once capable of moving large amounts of tourists, donkeys and supplies has now fallen into disrepair, with the upstream tourist stops of Dwali and Phurkyia following suit. Reconstruction and rerouting efforts by the Indian government and local PWD are continually thwarted by new landslides, floods and lack of local investment. Bharat, four students, and I wind our way up the valley staying on the south side of the river. Occasionally on rhododendron draped cobbled paths, occasionally on muddy river banks and always on slick wet surfaces, we follow our noses, cairns and Bharat’s subtle (and not so subtle) gestures. We navigate up and down steep, loose embankments, under overhanging banks of gravel and across recent mudslides. Up and down, over and under, we slowly peck away at the kilometers. A few klicks form Dwali we encounter a steep uphill that takes us back to the old overgrown, cobbled trail high on the hillside. We bush bash our way up the steep, slick hillside, following cairns through oaks, rhododendrons and moss covered boulders, gaining several hundred meters in fifteen minutes. After reaching the path we begin a traverse along “the way” that, at times, seems carved into the steep rock. Narrow exposed sections on wet rock, slippery downed branches and leaves plus the ubiquitous mud have us on our toes with keen awareness for close to 3/4 of a kilometer. The recent death of Thomas Plotkin on such terrain is never very far from my mind or lips. We cross the waterfall/creek that necessitated this high traverse and soon begin our descent, but the trail has been washed out by more recent landslides, so we slowly and cautiously pick our way down a steep gravelly gully, eventually gaining the river bank again, just below the Pindari/Kafni confluence. We pause briefly in the light rain. Snacks and water help boost morale and energy after eight hours on the go. Rough, mountainous terrain has been the rule, despite the cobbled paths we have occasionally used. We shoulder our packs and move upstream only to look up and find the morale boost we all really wanted. There, perched high above us, are the six or eight structures that make up Dwali. Whoops of joy and relief are sounded by all. Now we can start smelling the barn. Forty-five minutes of rocky, loose, and infrequently steep river bar walking later, with the addition of one crossing of a rickety bridge over a frothy brown turbulent have us dropping our packs onto the porch of another locked up tourist/guest house. Clouds cloak the valley, hiding the sources of the long wispy waterfalls emerging from the ephemeral mists as we sit, eat, change our socks and talk about the day’s travels. It will be another several hours before we see the headlamps of our compadres coming into view on the gravel bars down below. We will be together tonight, but this classic NOLS day has taken its toll on the group and we will lay over in Dwali tomorrow, savoring both our first clear day and first views of Nanda Devi, (the bliss-giving goddess) high up above the Pindari Valley.